In honor of NC Beer Month, I couldn't think of any better way to celebrate than participate in the Fayetteville Area Convention and Visitors Bureau's Hometown Hops Passport program! 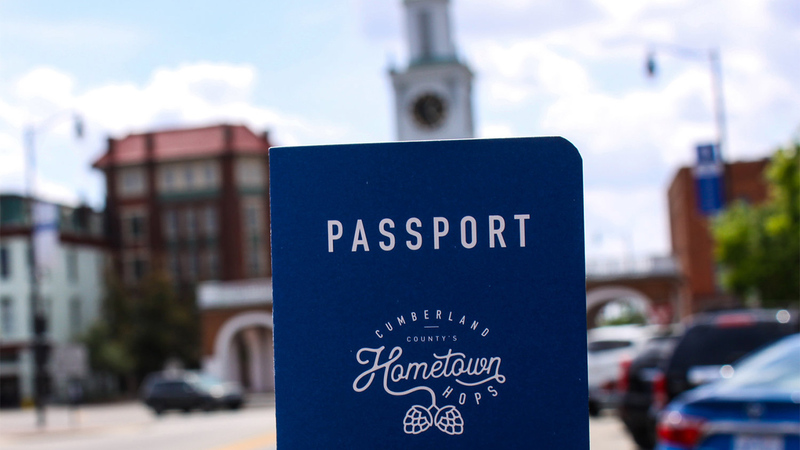 Home to five distinguished breweries, Cumberland County is ready to welcome brewery enthusiasts to America's Hometown with a perfect pour of a memorable craft brew. The first stop on the Passport is Mash House Brewing Company, known for hand-crafting their ales using traditional methods of Old World brewers. The Mash House staff was kind enough to let me try a massive flight that featured ALL of their beers and honestly there wasn't one that I didn't like. Come for the beer, stay for the food. Make sure to grab some of their delicious food when you stop in! I highly suggest ordering their housemade soft pretzels. Duriung my visit, I even got a tour of the brewery from their Brewmaster himself! If you ask nicely, they might even give you a tour as well! Stop #2 is veteran owned, Dirtbag Ales. Again, I was able to grab a flight of a few of their tasty brews. I generally opt for flights when I haven't been to a brewery before so I can sample everything then order what I liked! Dirtbag is known for their flagship brew, Blood Orange Kolsch, which I tried and loved. I also highly recommend their Cold Brew Mocha Porter. YUM! Beer flight at Dirtbag Brewery. Come for the beer, stay for their events and food trucks! Even though Dirtbag has slightly outgrown its current location, they still find the space to host amazing events including art shows, weekly run clubs, a farmers market, and brewery yoga! Namaste drinking tasty brews with my workout, y'all! The activities board at Dirtbag Ales. In just a few months, Dirtbag will open up their second location which will feature various ball fields, a dedicated space for their farmers market, as well as plenty of room for local food trucks to set up shop! Once you've collected your stamps at Mash House and Dirtbag Ales, stops #3, #4, and #5 will take you to the heart of Downtown Fayetteville! This area is full of history and is the home to a few of my favorite destinations, including the Floating Shanti, The Wine Shop, and The Coffee Cup! Beers at Bright Light Brewing Company. When I arrived, families were spread out across the brewery, laughing and playing board games while sampling house-made beers. Much like Dirtbag Ales, just visiting the brewery puts you into the middle of the brewing action. The floor plan is an open concept so you can see the brewmasters at work while enjoying a brew at the bar. Since four legged friends are welcomed at the brewery, locals don't pass up the chance to bring their fur babies. Don't worry, I snuggled every doggo in the building. Just like every other stop on this Tour de Brews, I grabbed a flight of beers. I particularly enjoyed their famed Lighthouse Stout before heading out back and checking out a local food truck! Stops 3 & 4.After lots of beer and puppy snugs, I took a walk down Hay St. to Huske Hardware House Restaurant & Brewery, known for their British-inspired pub grub and award-winning craft beers. Closing out this Tour de Brews is Lake Gaston Brewing Company, located in the celebrated Horne building. Be sure to try their All-American Strong Ale while you're in America's Hometown! Note that this brewery stop order is only a suggestion, not a requirement, so feel free to visit in whatever order you please! Beers on tap at Huske Hardware House Restaurant & Brewery. Huske is veteran owned and a Hay St staple yet I had never been though before. I know, who am I even? After talking to their wonderful staff about their in-house brewing process, I decided to try their limited edition Thin Mint Stout. I like my stouts to basically be milkshakes and this did not disappoint. While chugging down this delicious Thin Mint Stout, one of the owners was kind enough to take me on a tour! At this point, I had toured a few breweries so I pretty much felt like I was a brewmaster myself. Last stop. Closing out the passport program is Lake Gaston Brewing Company, located in the celebrated Horne building. Be sure to try their All-American Strong Ale because you are in America's Hometown after all! Note that this brewery stop order is only a suggestion, not a requirement, so feel free to visit in whatever order you please! Bringing the world of craft brew and a little Lake Gaston nostalgia to the home of the Army's largest installation, the Lake Gaston Brewing Company offers locally brewed craft beer, delicious chef-prepared fare, and new memories of the beautiful lake. Make sure to try their All-American Strong Ale which is malt forward, nutty with moderate sweetness. Once all stamps are collected, participants are encouraged to drop by the Fayetteville Area Convention and Visitors Bureau (245 Person St, Fayetteville, NC 28301) to collect their prizes! I made sure to stop in and grab a t-shirt for myself. You'll also note that visiting each of these breweries isn't a requirement, just a suggestion! For those visiting from out of town, the FACVB team will also be able to help suggest other activities in the area, as well as hotels for those who enjoyed these local brews just a little too much. In a hurry and can't drop by the CVB? You can always email photos of each completed passport page to info@visitfayettevillenc.com! Melinda is an ABC11 Community Influencer. Read more of her work on her blog .